The Republic of Ghana is unique in many ways. It was the first African country to attain independence from colonial rule on March 6, 1957. It is an English speaking country surrounded by French speaking Togo, Cote D’Ivoire and Burkina Faso. The southern border is a stretch of beautiful coastline with inviting beaches. Why would you want to go there? For its historical significance during the slave trade, for its beautiful coastline and warm weather, for its friendly people, political stability or perhaps for its amazing traditional arts and culture. Although Ghana is a small country, its indigenous crafts are collected worldwide. Many festivals and activities celebrate its rich culture and heritage. Ghana is the perfect destination for anyone with a strong interest in African art and culture. Like most countries, it is experiencing modernization so festivals are becoming less elaborate and artisans are updating traditional techniques. But there are still opportunities to experience thrilling displays, and to see examples of traditional and indigenous crafts. Each of Ghana’s 10 regions has a distinctive personality. GHANA ROCKS! The Ghanaians most familiar to visitors are the Ashanti. Members of the Akan peoples, they are the largest ethnic group and are known as fierce fighters who resisted the British invasion for many years. For anyone going to Ghana for its traditional crafts the ASHANTI REGION has to be visited. The capital of the Ashanti Region, Kumasi and the surrounding crafts villages have the largest concentration of indigenous crafts because the Ashanti King and his entourage are their patrons. When the king appears in a durbar (a state ceremony) someone has to walk beside him and support his arm because it is weighed down with gold. In the Akan culture creativity is viewed as having divine qualities and craftsmen are called borebore which means 'God'. The workmanship is exquisite and the gold mine is in nearby Obuasi. Ghana was called the Gold Coast during British occupation and it is said that gold dust flowed in the street when it rained. Kumasi is the second largest city in Ghana and the Kumasi Central Market, said to be the largest outdoor market in West Africa, is a shoppers' paradise. There are several crafts villages near Kumasi.They were originally established centuries ago to provide regalia for the king and his court and are still active, although now anyone who can afford them can buy the crafts. Bonwire is famous because it was the first Ashanti weaving village. Bonwire, which takes its name from a thorn bush, is very much a tourist attraction, so much so that even the children overwhelm visitors in an attempt to get them to buy something. In previous times master weavers from Bonwire were commissioned to create Kente cloth for the king. Real gold was woven into the cloth. There are many colorful stories about the weavers. It is said that the weavers were willing to die for their king and sometimes did. After finishing a particularly beautiful piece the weaver might be put to death so that the cloth could not be woven for anyone else. There is also a story that says that once in a while the weaver would purposely make a mistake. Since the king couldn’t wear a less than perfect cloth, the weaver would be given permission to sell the cloth. Just by looking at a piece of Kente cloth you can sense that it is special. It is desirable to Ghanaians to wear on special occasions and it is also in demand by collectors from all over the world because of its universal appeal. African Americans have adopted Kente to symbolize connection to their roots and others cherish ownership because they feel the power emanating from the rich color and design. Because of its importance and price, a piece is sometimes presented to an older Ghanaian by his children to show respect and to thank him for their upbringing. All patterns have names and one of them loosely translates to “my skill is exhausted”, reflecting the intricate pattern and skill involved in weaving it. Contemporary Kente is not the same as the traditional. Rayon has replaced silk, gold threads are long gone and traditional colors are giving way to those that attract tourists. There was a time when blue and white kente was popular, but the blue indigo is seldom used today in Ghana. 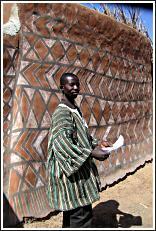 Ntonso is the Adinkra village and visitors can still see men stamping Adinkra patterns on cloth. Adinkra is unique to Ghana and is believed to have started around 1800. Designs are carved into a small piece of calabash, dipped in a black tar like substance (a dye made by boiling the bark of the badie tree for two days) and stamped onto cotton cloth. The designs are based on African proverbs and have meanings to those who can interpret them. There was a time when a man could order a cloth with a message depending on what stamps were used, but now most people buy the cloth “as is” taking whatever is available or appeals to them. There are many adinkra meanings, but the most popular is probably Gye Nyame meaning that the wearer of the cloth relied only on God for protection. There are over 60 symbols used today and more coming. Not restricting themselves to traditional proverbs, stamp carvers are using contemporary themes for inspiration. There are several theories about the origin of Adinkra. Some say it was developed after the 19th C. defeat of the Gyaman King Kofi Adinkra who had dared to replicate the sacred “Golden Stool” of the Ashanti. Another story says that it means the final farewell. Adinkra was traditionally black designs on black cloth and was worn to funerals. Today Adinkra cloth comes in many bright colors (although the designs are always black) and is also worn on festive occasions. Since it is less expensive than Kente, it is sometimes worn on festive occasions in place of that cloth. The men wear the cloth like a toga over their left shoulder. Sometimes women will wear adinkra and when they do it is usually sewn into a blouse and another piece is wrapped around the waist as a skirt. Curiously, the materials the men use are from the North, but Adinkra is not made in the North. Adinkra symbols are on everything nowadays. They are painted on buildings, walls, ceramics, jewelry and almost any art form you can think of. Museum shops have glasses with adinkra symbols etched into them and almost every kindergarten class studying Africa has made a potato print of an adinkra symbol. Machine printed adinkra cloth has flooded the market in Accra and New York. And a new innovation by the makers of the cloth is silkscreeing the symbols instead of using the stamps. Ahwiaa is the main Ashanti wood carving village. Important products here are the stools and Akua'Ba figures. Traditionally the stool is carved from one piece of wood with 3 sections: the crescent shaped seat, the central support column and the rectangular base. The design on the support column tell the meaning and function of the stool. Ceremonial stools, as with other arts, are the most elaborately decorated. The state stools act as a spiritual and political connection between the royal ancestors, the current ruler, the state, the clan and the individuals. It is the Ashanti belief that the stool is the receptacle of the soul. Chiefs are enstooled and when they die their stools are preserved with great ceremony in shrines. Stools are also everyday items, often used instead of chairs. They range from simple and unadorned to beautiful sculptures representing animals. Traditionally it was customary for a father to give his new born child a stool to signal a sense of belonging to the family. Legend tells of the Golden Stool and it is said that it fell from heaven into the lap of Okomfo Anokye the advisor to King Osei Tutu in the 17th C. The Asante went to war with the British because the British stole the Golden Stool. Years later it was revealed that the Asante had substituted another stool and were still in possession of the Golden Stool, but its whereabouts, to this day, is a secret. Akua’Ba figures are another product carved from wood. They are used by Akan women as fertility figures. If the woman has trouble becoming pregnant, she takes the figure to a shrine to be blessed and then carries it with her. They are also used to ensure the birth of a beautiful child and the tall flat forehead of the dolls is considered a sign of beauty. There are also fertility wooden carvings of breastfeeding women and baby-carrying females. It was important to the Akan to have many children. The ideal number was 10! Krofrom: Ghana, once known as the Gold Coast, needed weights to measure the gold. Brass weights cleverly embellished with designs were used for this purpose. These weights were made by men using the lost wax technique. When paper money came into use, it looked as if the brass weight technology might be lost, but the artisans in Krofrom have revived it by casting contemporary items with new uses: brass hooks, drawer pulls, boxes, napkin rings are among the beautiful and fun items to be found. As soon as one praises one region something unique is found in another one. The VOLTA REGION is home to the Ewe. There are two ethnic groups in Ghana who weave Kente cloth: the Ashanti and the Ewe, who came first and is more innovative depends on your source of information. Although the Ashanti Kente may be better known, at least to Americans, the Ewe kente is quite beautiful and innovative. Older pieces of Kente were dyed with vegetable dyes, giving them a muted beauty. In contrast to rayon favored by Ashanti weavers, the Ewe use cotton. Although no longer using vegetable dyes, many of them use hand dyed yarn. Although there is overlap in techniques, one can distinguish the Ewe Kente from the Ashanti because the Ewe weave figures and symbols into their cloth. There is more diversity in the Ewe patterns. Usually Ewe cloth is woven to order for Ghanaians, but the tourists have become customers also and concessions have been made in color and style in cloth that they buy and seem to prefer. The main cloth market is in Agbozume which is close to the Togo border. The market is open on every fifth day and attracts buyers from all over West Africa. GREATER ACCRA REGION – Accra is the capital of Ghana, and the largest city, making it a magnet for a diverse population. More and more artisans are moving to the Accra area because they feel that they will have access to a larger audience. The National Museum is a good place to start your art voyage. There are some wonderful examples of traditional art. In the National Centre for Art and Culture vendors rent booths and sell work from all over Africa. At first glance it might appear to be geared toward tourists, but there are also some good examples of traditional pieces worth examining. Patience and an educated eye are helpful here. There are also two galleries of contemporary art, also at the arts center, that should not be missed. Teshie/Nungua are two villages side by side about a 30 minute ride from Accra. They are home to the fantasy coffin workshops and are definitely worth a visit. These coffins are in the shape of birds, fish, airplanes, even beer bottles. The most popular seems to be the white Mercedes. These coffins are fairly expensive by anyone’s standards, so only important people are buried in them. The coffin image has some relationship to the life of its recipient. A farmer might be buried in an onion or a fisherman in a tuna. Ever inventive, the carpenters are now making miniature shapes so that tourists can fit them into a suitcase. This relatively new folk art started in one carpentry workshop around 1960. Now there are several workshops, but they are all within a few miles of each other. Because of articles in many foreign magazines like National Geographic, these sculptures have become collector items in the western world. The book “Going into Darkness” by Thierry Secretan has some wonderful photos of the coffins and funerals. CENTRAL REGION. One of the notable craft items from this region is the Asafo flag. Each Fanti village had a militia unit and when going into battle these appliquéd flags were “danced” at the head of the column. 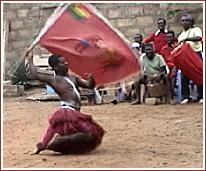 Some villages have several Asafo companies and each has a flag with their own proverb and symbolism. Although no longer going to war, the companies are still actively involved in village ceremonies. The EASTERN REGION is the ancestral home of the Krobo, who are famous for their beads. Krobo women treasure their collections and it is believed that great disaster will come to one who sold their beads without a very good reason. When you ask Ghanaians where beads come from some will say that they come from the ground. Indeed many have been dug up, but originally the beads came from Nigeria with traders. Now there are many Krobo bead workshops where glass beads are made in ceramic moulds by firing in woodburning kilns. Traditionally made by men, it takes several years of apprentership to be able to form some of the intricate patterns associated with African beads. Dipo is a female coming of age ceremony celebrated by the Krobo each April. This gives the families an opportunity to cover the girls with beads to display the family collection. Some families even rent beads to make the display more impressive. Although many people still celebrate Dipo, there is controversy surrounding the way the girls are dressed. They wear very little besides beads and are uncovered from the waist up. Some also feel that it is an “unchristian” rite because there are priests and priestesses involved. The Krobo are very bound by tradition, so even with the controversy, the Dipo continues. In October the Krobo celebrate their original home in the mountains. The British forced the Krobo to leave their mountain homes and settle in the valley. There is a pilgramage and a difficult walk back up the mountain to honor the ancestors and remember where the ethnic group came from. Historically, the UPPER EAST REGION was the crossroads for trans-Saharan trade routes. Here the paths from North Africa split, with one path continuing to Nigeria and the other heading south to Tamale. Commercial traders carrying manufactured goods south and gold and ivory north brought Islam to the area in the 9th century. Today Tamale is still a commercial center, but few tourists make the journey from Tamale to Bolgatanga, the Upper East’s capital. It is, however, a region with distinctive crafts and architecture. Most notable among the crafts are basket weaving, pottery, leather and decorative house painting. 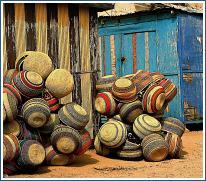 Baskets: Bolgatanga is well known for the large colorful market baskets made by the Frafra women. Elephant grass for the baskets is harvested to the south around Kumasi and purchased in the Bolga market. The dyed grass is woven into large round-bottomed baskets with broad stripes and geometric patterns. The women in the village of Sherigu have formed a basket making cooperative. Their baskets are also sold by Abu Ayolgo, a vendor in the Accra Arts Market. In contrast to the Bolga baskets, the women of Sirigu make smaller conical baskets with square bottoms and round top. Working only in shades of brown, the geometric designs on these baskets tend to be more complex than the Bolga market baskets. Decorative Wall Painting: Sirigu, a small village about 30 km northwest of Bolga, is famous for the murals on the walls of their homes. After finely burnishing the walls of their mud houses, the houses are painted with brown, black and white earth pigments. The patterns, a combination of animals and geometric designs, all have symbolic meaning. The women have founded SWOPA, the Sirigu Women’s Organization for Pottery and Art. Visitors are invited to tour their compounds, take workshops, enjoy their visitors’ center and gallery and stay in their traditionally decorated guest houses. In some buildings, more contemporary construction techniques are used - cement blocks decorated with acrylic paint. While the colors are a little harsher, the quality of the painting is just as fine. Other painted houses can be toured at VOPAC (Village of Pottery Art and Culture), about 5 miles west of Bolga. Pottery: Sirigu is also known for its pottery. Shaped by hand from wide coils and fired in open bonfires, much of the pottery is undecorated other than the marks from the fire. However, some of the pottery is highly decorated with many of the same patterns – diamonds, zig-zags, pythons – that are found painted on Sirigu houses. After firing, the surfaces are often sealed with the same locus bean lacquer used to seal the house walls. 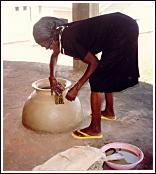 Pots vary from huge storage containers to smaller pots for shea butter and fetishes. 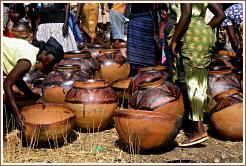 For sheer quantity, the Sirigu market is the place to see pots, but the SWOPA gallery offers a wider range of styles. SWOPA also offers workshops in pottery making. Clothing and indigo dying: The traditional men’s garment in Northern Ghana is the fugu - a loose-fitting tunic made from hand-woven cotton strips. The Bolga market is a good place to see them sewn and to see a variety of styles of fugus from around the region. Daboya, near Tamale in the NORTHERN REGION, is the only village in Ghana that still does indigo dying. In Daboya, sections of cotton yarn are wrapped in leather to create an area that resists the dye. It is soaked in large, open-air vats of indigenous indigo. The yarn is dried in the sun, woven and sewn into fugus. Architecture: Not surprising in the arid climate of Northern Ghana, mud is a common building material for houses. Both inexpensive and strong, it is a medium with sculptural possibilities. Traditional houses are built using a combination of adobe brick and hand-shaped mud cob while the surfaces are stabilized with cow dung and a lacquer made from a local locust tree bean. Generally, family compounds are built around shared courtyards circled by high mud walls that provide privacy and enclosure for the household animals at night. The more traditional houses are round with pitched thatch or flat roofs that serve as sleeping quarters. The styles of the houses and structure of the compounds vary throughout the region, reflecting various ethnic traditions. The Navrongo Cathedral is a striking example of the merging of secular and sacred architecture. With its rectangular shape and tall, stocky bell tower, it has all the outward appearance of a Western Roman Catholic church. Inside, however, its mud walls are decorated using traditional house-painting techniques with Catholic and traditional symbolism appearing side by side. This may be the only church where the snake appears not as the Christian symbol of sin and temptation but as a python, the indigenous symbol of protection. The museum next to the Cathedral has excellent exhibits on local crafts. The mosque at Larambanga was built in western Sudanese style in the 17th century and is carefully maintained by the local community. With its dark supporting wooden poles, gently curved buttresses and whitewashed exterior, it is a beautiful example of the combination of Islamic architectural styles brought by early traders and indigenous building techniques. Roles in traditional African life are clearly defined. Men are the weavers, basket makers, brass casters and adinkra stampers and women the potters and mat weavers. When you talk about African crafts you have to distinguish between traditional and contemporary for now you can see women weaving in Bonwire and most university trained potters are men although in villages women still rule. Painted signs. Almost every establishment in Ghana has a sign indicating what is sold inside. There might be a picture of a barber cutting hair or various pieces of meat that are for sale. Probably the most graphic are the signs that advertise cures for boils, diarrhea - and any other ailment imaginable. Sometimes the signs are more elaborate than the business they advertise. Often, you see men walking the street with a barber sign tucked under their arm and if you want a haircut they set up shop right on the street. These signs have become collector items for tourists and they are an example of a very innovative folk art. Research suggests that pottery was probably the earliest art form in Ghana. According to a Ghanaian legend, the first potter was a woman named Osra Abogye from Tafo and she was taught by God. It is also believed that the earliest work was produced between the 10th and 14th Century AD. Traditional pottery in Ghana is simple and functional and hand built. There is little decoration and glaze is not common. The color of pots depends largely on the type of clay used, although some pots are black from the smoke created during firing. Pots are still used to prepare, cook and store food. Large water pots, by being partially sunk into the ground, keep water cool. Perhaps the most functional clay pot is the grinding bowl which is shallow with ridges on the inside. Pots are low fired, therefore fragile, but inexpensive and for sale in every market and often on the roadside. There are ceremonial pots that are elaborately constructed and often decorated with relief, etching or moulded designs. Such a pot might be used to store the hair and fingernails of the deceased and placed on their grave. Similar pots would be placed with it and for a period of time food would be left for the departed. Ghanaian tradition says that spirits live in every object and that the spirits must be appeased by following certain rules, so potters traditionally would only dig clay on certain auspicious days, would not talk while potting, would not intentionally break a pot and would not leave an empty pot standing overnight because the Gods might come at night and leave poison in the pot. In Western societies many potters put a small clay “kiln God” on the kiln to insure a good firing, so it’s not only Africans who appease the spirits! Traditional potters in villages are women and contemporary potters, usually university trained, tend to be men. It is difficult to earn a living as a contemporary potter because decorative pots are not part of the Ghanaian tradition and the tourist market is not strong because of the weight and fragility of the pots. A few potters have a viable market with companies overseas and when they have a big order they will hire other potters on a temporary basis. So they struggle to survive. Also, glazes are limited in color, unless imported, and both indigenous and imported glazes are expensive, some potters resort to coloring with oil paint. I suppose it’s a question of aesthetics, but for most westerners it’s difficult to relate to clay sprayed with garish oil paint. Tie & dye and batik are alive and well in Ghana. The government has declared Friday a day to wear Ghanaian clothing and most men who recognize this choose to wear a batiked or tie dyed shirt. Although there are machine made cloths, it tends to be a home based industry done in people's yards. Unlike the cassava paste used in Nigeria, the Ghanaian batik is done with wax. Commercial dyes are imported from Germany and England. There are many clever tie and dye techniques. Some introduced to Ghana by artists from Niger. An interesting craft is that of carving fishing boats. It’s fascinating to watch the fishermen carve from a huge log. And then they finish with designs carved into the sides of the boat and with painted symbols and letters and colorful flags flying. That combined with various colors of fishing nets is an attractive photo opportunity. Akunitan. In the 15th C. this “cloth for bravery” was a broad felt fabric on which were appliquéd, embroidered or quilted abstract and figurative motifs of symbolic significance. Many of them tell of successful military campaigns or tell of power, wealth or prestige. When discussing African art, it’s necessary to know that all traditional and most contemporary art is functional. Even though much of it is aesthetically pleasing it was created to be used. 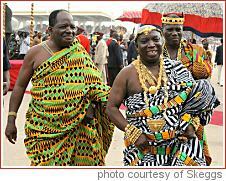 The decorations could serve as a means of communication, as in the adinkra symbols that are based on proverbs, and the regalia worn by chiefs and their entourage conveying messages of power, wealth and prestige. Art work for state regalia is carefully controlled as to colors and designs, but there is still room for the artists to reach the highest level of creativity and they take great pride in their work. Although adapting to changes, Ghana is still an important destination for people interested in both traditional and contemporary african arts and crafts. Nothing can surpass the workmanship in old pieces of Kente that can still be found and, although some of the contemporary crafts stray in aesthetics and sometimes workmanship, there is a predominance of talented artisans in Ghana.